After leaving school Michael served his apprenticeship at Independent Funeral Directors in and around Sheffield. After building his experience over 25 years and seeing Family Independent Funeral Directors being taken over by large Cooperatives Michael decided to bring tradition and a personal touch to his own Independent company. Many large cooperatives have taken over small companies but have retained the name and this can be very misleading. If the company does not say Independent they are a part of a large network. 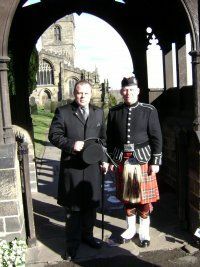 Although a relatively young company Michael has many years experience and training from old traditional Funeral Directors who have sadly departed now. Michael is passionate about his vocation and caring for families who have lost their loved one. He believes that he is very privileged to be able to care for your loved one who has departed and guides you every step of the way.